Gold is shining, and both bullion and gold mining stocks are lighting up the scoreboard with outstanding gains so far in 2016. It is my contention that gold is not just simply immersed in a bull market, but I think there are great reasons to believe that this golden bull will keep running for some time. Through just the first quarter of the year, the ETF with the largest physical holding of gold, the SPDR Gold Trust (GLD), is up nearly 16%. That’s a very strong move for any asset class, but particularly for a commodity known more for its hedging properties, as well as its cash-alternative appeal. 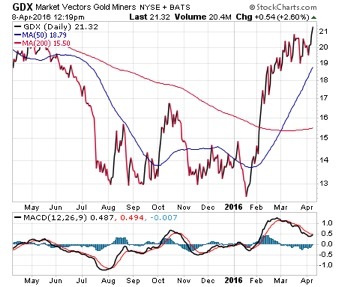 Then there’s the action in gold and precious metals mining stocks, as represented by the Market Vectors Gold Miners ETF (GDX). Year to date, GDX shares have spiked nearly 46%! Yes, you read that right — 46%. While subscribers to my Successful ETF Investing newsletter have been profiting from these two funds for some time, there are other ways to take advantage of gold as well. 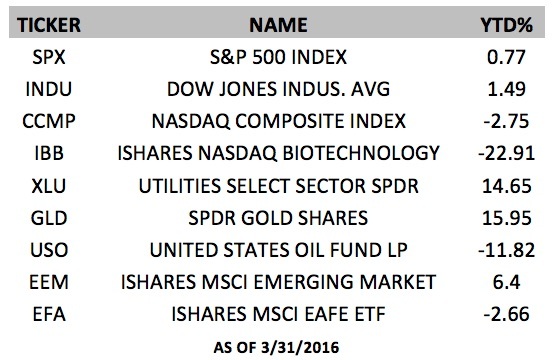 The table below shows some of the best ways to participate in this golden bull market. 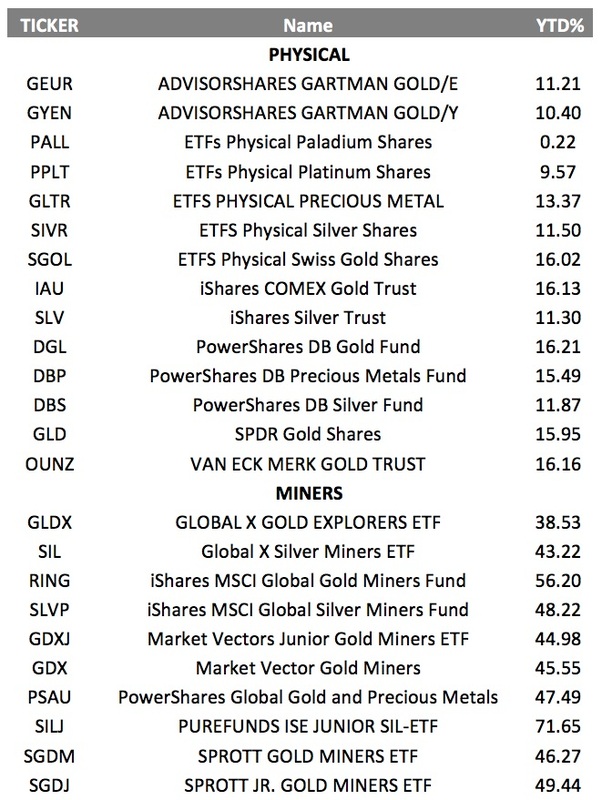 Now, we are not suggesting investors pile into all of these funds, but we are showing you how many different ways you now have, thanks to the ETF revolution, to profit from the variety of gold and precious metals mining stock funds out there. 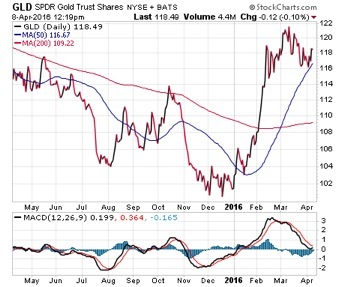 Why should you think about gold and mining stocks right now? Well, the way I see it, there are several golden reasons to like the yellow metal and stocks related to it. First, gold is the ultimate “fear trade,” and right now there are fears of a global growth slowdown, a China currency and economic collapse, the continued decline in the value of the U.S. dollar and geopolitical tensions abroad. Even election uncertainty here at home has many investors adding a bit of gold to their portfolios. Then there’s the weakness in currencies around the world, fear of a global debt explosion, central banks around the world experimenting with “negative interest rates,” and even banks waging what I call a “war on cash,” making it hard for people to actually get money in the form of cash out of the bank. Finally, and most importantly, people are buying gold and gold mining stocks, and that’s evinced by the price action in the sector. 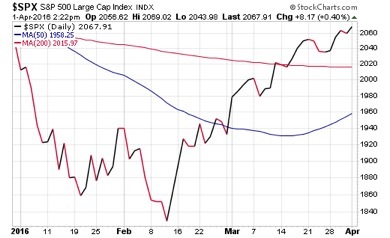 Until that price action shows signs of abating, the golden bull will keep on running. As you can see, the markets plunged from the outset tumbling close to bear-market territory on a combination of plunging oil prices, China angst, global slowdown fears and geopolitical tensions. Then the markets regained some life in mid-February on a combination of rising oil prices, an easing of China and global slowdown fears, and then finally on a “dovish” surprise from the Federal Reserve at the March 16 Federal Open Market Committee (FOMC) meeting. As you can see, the S&P 500 and Dow ended Q1 in positive territory, albeit just slightly, while the NASDAQ Composite still hasn’t returned to the black for the year. And while some sectors did very well in Q1 (utilities, gold, and even emerging markets) other sectors got crushed, including biotech and oil. The fall in biotech was troubling for markets, as that had been one of the leading sectors in 2015, and one that many predicted would lead markets higher this year. To me, the resurgence in the emerging markets via the iShares MSCI Emerging Market ETF (EEM) is one of the biggest developments in this swinging Q1. The reason why is because this is a sector that got pounded in 2015, and one that needed to start coming back if there was going to be a wider global equity recovery. The rebound in EEM tells me that the smart money is thinking along the same strategic lines as we’ve been this year, and that’s always a great confirming indicator for your market thesis. We won’t know for certain until another three months have passed, but one thing I think we can say is that investors need to be prepared for just about anything in the coming quarter, as surprise swings such as we saw in the first quarter can happen to markets without notice, despite the best-laid plans of even the smartest participants. The eminent theoretical physicist and one of the creators of the hydrogen bomb knew more than just a thing or two about science and technology. But to get the technology that can be used to improve our lives, and even win wars, first you must have the science to figure it all out. This logic can be applied to anything in life, especially investing. First learn the science, then create the technology to make it work for you. In case you missed it, I encourage you to read my column from last week about the first quarter’s wild swings. I also invite you to comment about my column in the space provided below. Economist Dr. Mark Skousen gives his takes on the recent rally in gold and where it may go from here.